We'd love to see you on Easter! Join Lakeland Baptist Church for Easter Sunday on Sunday morning, April 21st at 10:30 AM! We'd love for you to be our guest on Easter as we celebrate the reality of the resurrection and talk about why it's central to the history of the world and why it should be central to each of our lives. 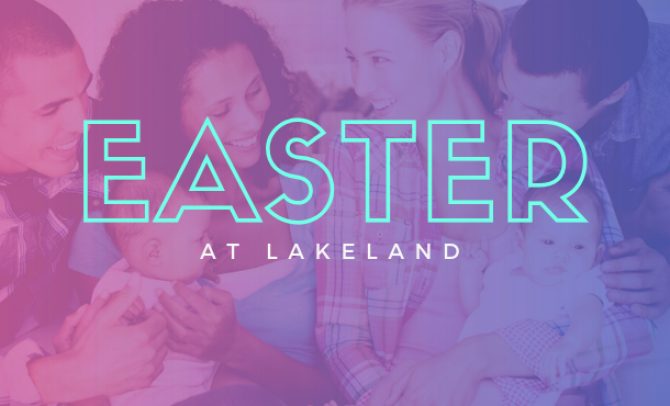 Whether you typically attend Easter services or have never stepped foot in a church before, you are welcome at Lakeland and we'd love to meet you! We will have Sunday School that morning at 9:00 AM. We would love to have you check out a Sunday School class if you are interested! Friday, April 19th at 7:00 PM at Lakeland. Join us as we reflect upon the death of Christ for the sins of the world. Saturday, April 20th at 10:00 AM. The Easter Egg Hunt will be at Central Park in Lewisville (off Edmonds Street). Join us for a fun time of activities for the whole family.